JAM - NSW Folk Federation - The Rainmakers - first Sydney gig! 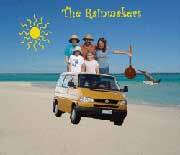 The Rainmakers is a family from the dry parts of Central Victoria, who have been having an extraordinary effect on the weather in the dry parts of Western Australia during the last 6 months – mainly, they suppose, because they were camping in tents! They are Jane Thompson and James Rigby (from nationally acclaimed folk band Blackwood) with their 3 daughters, Maggie, 14, Elsie, 12, and Naomi, 10. They sing with sublime harmonies born of many hours together in the confines of the car, and play various instruments, from marimba and ukulele, to guitar, fiddles and accordion. The Rainmakers’ rapidly expanding repertoire includes award-winning originals, addressing matters of the heart and issues of our time; Australian songs with distinctive arrangements; and close-harmony a cappella songs from Samoa, Torres Strait Is, indigenous America and close-to-home, sung with great musicality and charm. Their diversity, skill and personable approach is widely appealing. 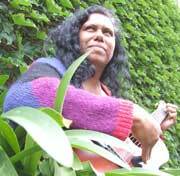 + Rhubee Neale – Indigenous performer with heart and soul! at Eastside Arts. $20/$15. Limited places!